With technology becoming an integral part of human life, people now prefer to perform most tasks from the comfort of their home. Technological revolution has made everything available to you in just a few clicks. Now, everything comes to your doorstep without you needing to step out, including learning a new skill. People who had always wanted to learn cooking, but could not find time to go to a school to learn now have a better option. The online culinary school provides all the learning and knowledge you could gather from a conventional culinary school. The remarkable difference: from the comfort of your house and at your own time. Online culinary school is a platform where people eager to learn cooking can meet chefs and learn the art & science of cooking. This gives the customers a comfortable place and pace to learn cooking from the best chefs. Learning cooking from international chefs is almost impossible in the physical world. Their online cooking lessons, thus, are always in demand and make online culinary school a prolific business model. A student can learn cooking from anywhere, anytime and any device. Following is the step-wise working of the website. Select the category you are interested in i.e. Individual, group, health and wellness, etc. A list of all the courses available for the student or group will appear. Check the course they want to learn. Study the course details like course start date, tuition fee, the food, learning platform and instructor. Pay for the course and start the course on the given date. 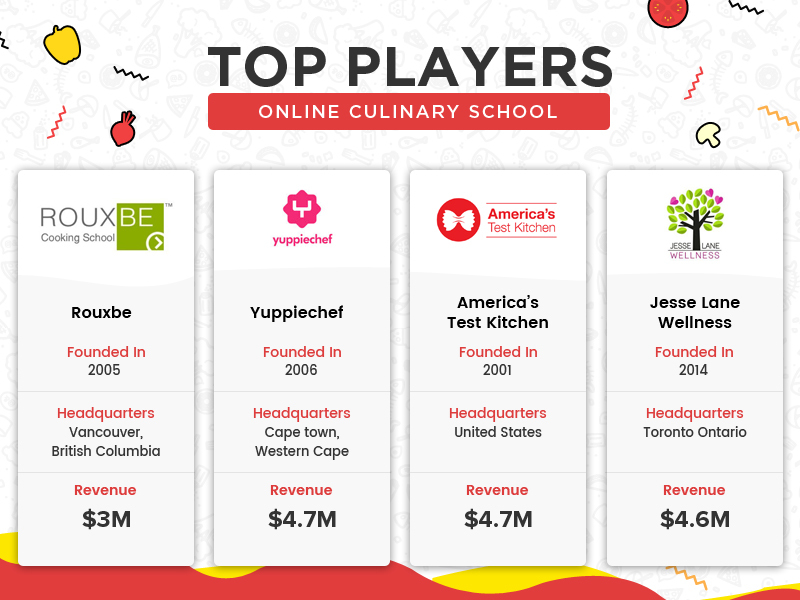 Few of the top market players in this league are ROUXBE cooking school, Yuppiechef, America’s Test Kitchen and Jesse Lane Wellness. Founded in 2001, America’s Test Kitchen is the most experienced brand among the four. Jesse Lane Wellness is the youngest and has been operating successfully since 2014. All of them are garnering annual revenue of $3 – $5 million. Tuition Fee- When a student joins a specific course, they pay a certain amount to the website to be a part of the course, called the tuition fee. It is first transferred to the website owner who deducts a certain percentage of the fee and then sends the rest to the instructor/chef. Membership fee- When an instructor wants to be part of the business, he/she has to pay a membership fee which is received by the business owner. This is not just a source of revenue for the business owner but also authenticity check of the chef/instructor. This shows that the chef/instructor will stay dedicated to the brand. Keep the membership charges as low as possible.There can be membership option for users too. Some users would want to be a part of all culinary courses, simultaneously or consecutively. They can pay a small fee during the sign-up process which gives them extra benefits from rest of the students. Merchandise & e-commerce store- It has become very important for an online culinary school to sell the products that they use in their course. Some countries/cities may not get those ingredients or cookware. So an online culinary school owner can sell those products on their website. This depends on the discretion of the owner if he wants it a multivendor e-commerce or an e-commerce store. Either way, it will help in adding up to the revenue of the website. There are varied groups of people who want to take up an online culinary course. While some individuals would like to learn cooking for their daily meal or satisfy their passion, a group of individuals might want to take the course for professional assistance. There might be another group who would like to learn only specific kind of food for a particular reason like cooking for elderly, kids, health conscious and such. On the homepage of the online culinary school, the website must have main category section where the users can choose what category they are interested in. The classes for each category will depend on their interest and complexity. One of the best things about an online culinary school is that it gives an individual the choice to select the kind of dishes they want to learn. While some might be interested in preparing vegan food, others might want to learn only baking. After selecting the preferred category, visitors should have the option to check if your website has the course they are finding. Mention all the dishes you will teach, the duration of the course, etc. The course wise segregation makes the online culinary school website easy for the visitor to select their course and checkout. Testimonials provide visitors with a surety that the website they are on has good services and they will surely benefit from it. As people have become tech-savvy, they prefer checking the reviews and testimonials of previous customers before spending money. It is vital for an online culinary school to have a testimonial section, where new visitors or chefs can read the experience of the previous customers. A dedicated section for instructors/ previous students to write their user review i.e. what they have learned from their experience with the website. When a particular user selects a course, they wish to know the instructor, their education qualification, and their experience in the industry.Similar to a brick and mortar school, a teacher would dedicate the first few minutes of the first day of the class to introduce themselves. In an online culinary school, it is important that the visitor gets to know the dedicated instructor. In this section, the business owner can also include ratings which the instructors have received from previous students. This will give the instructors a challenge to provide the best instruction and provides the visitor with a meter on which they can judge their instructor. It is best to provide all the information to the visitor at a single place, so they do not have to navigate across the website to perform one task. Inform visitor the fee and starting date of the course. This is helpful as a customer will make the final decision with maximum information. Mention everything regarding a course at one place. This helps the customers check their budget, their time slots and book a course they want to learn. Most marketers mention that blogs are the best way to educate your visitor. If you are looking for more reason to add a blog section to your website, know that blogs can be a huge way to optimize your website for search engines. Adding your niche related keywords can help your website be in top ranks of SERPs. Online culinary schools must have a blog section as you can inform your visitors why the online school is better than offline schools. They can also impart knowledge on other aspects of cooking, such as using oils, finding right nutrition source, etc. Once the visitor is engaged with the content, there are higher chances of converting them. As and when a customer attends a course, he would like to prepare the dish on their own. Some of the ingredients or cookware mentioned in the course may not be available to the customer or in the local market. This is one of the biggest problems of online courses, which is why people prefer to go to a brick and mortar school. An easier and revenue yielding option for online culinary school is to provide cookware and ingredients on the website itself. People prefer to do more tasks on one website rather than shifting websites. So online culinary website can have an e-commerce website in it where the website sells cookware and ingredients for the customer to buy. This is totally on the discretion of the website owner whether they want it multivendor or an e-commerce store. An online culinary school is a bridge between chefs and individuals who want to learn cooking. So it is very important that they have a good number of Instructors available to conduct the courses. All online culinary school must have a career page where chefs can apply for a job. An online form must be provided where they enter their educational details and certificates. After the chefs are accepted by the website, they are assigned a class depending on their expertise. The visitors must be aware of the course quality before signing up for it. Free demos help the confused customers make a final decision whether they should pay for the course or not. Online Culinary School must have a section where the visitors can check free online demo of the course. This may or may not include a whole recipe, but online demo gives a gist of what customers should expect further from the website. It can be a free demo for different courses or a single free demo of any randomly picked course. After a customer has taken a course, he may have questions related to the techniques or the ingredients used. Even when they start preparing the dish by themselves, many questions would pop up in their head to be asked to the instructor. Online culinary schools must have a Q/A forum section where the students can ask their question related to cooking. Segregate different instructors into a different forum where the students can ask their doubts on a single forum and the instructor can reply to the question easily. There always has been an argument whether online schools can provide the interactive experience of an offline school. This is one of the shortcomings of the online culinary school where students cannot interact with their instructor in the physical world. The online culinary school can provide different and innovative features that do not disrupt the communication between the instructor and the student. Q/A forums, live chat options will do the trick of making them feel comfortable. They can also arrange a one-day cooking session or competition for the people of one locality. If they have many students from one city, they can arrange an event where the students can interact with the instructor in person. This can provide the website with a very nice platform to attract more visitors to their website. As mentioned above in the post and most cooking experts will agree with, there are some ingredients that cannot be found locally if trainees are preparing a delicacy in some other country. The online culinary school can have an ecommerce store in the website. Provide all the cookware and ingredients mentioned by instructors or that are rare to find. People are looking forward learn something online without disrupting their daily schedule by a great deal. This is why online culinary schools have become a very big hype recently. Launch an online culinary school to provide a platform for learning and teaching the art of cooking. 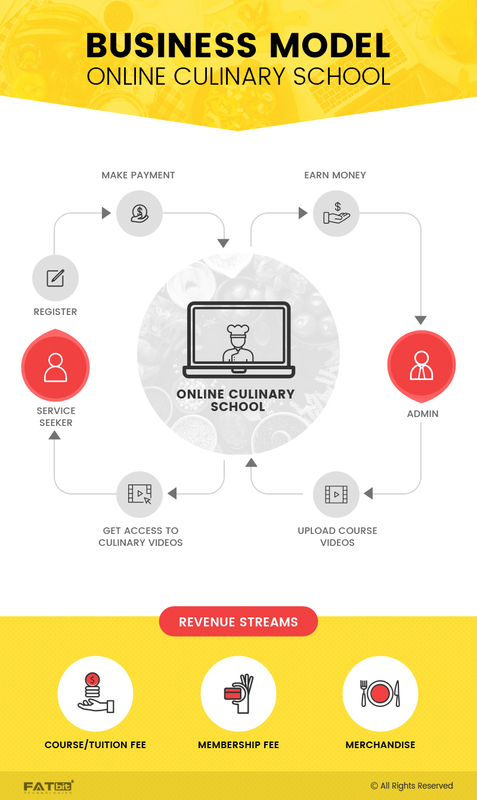 The business model, revenue model, market players, critical features and shortcomings mentioned above will help you in making the final decision if online culinary school is your new business venture. Posted in Web Based Business Models and tagged as Online Culinary School, best online culinary school by Kavya Nair.